As college spring breakers are flocking to the tropical beaches of Florida, it seems like the perfect time to share my Spring Break 2k15 adventure. While most college students pile their friends into a car and trek down to either Panama City Beach or Miami, with the intent of spending the week pounding beers on a beach, I took a more sophisticated approach. My parents and I made a last minute decision to fly down to Tampa, Florida, and then drive up to Thomasville, Georgia to visit my brother, then back down to Tampa (with my brother) to watch a Yankees vs Pirates spring training game, and then finally fly back to the pristine, yet a little colder, shores of Lake Erie. The main attraction for me on this voyage was, with-out-a-doubt, experiencing the wonders of spring training, even if it was with the New York Yankees. Of course, the Cleveland Indians spring training would be ideal to attend, but I’ll have to save that for another year (aka, next spring break). 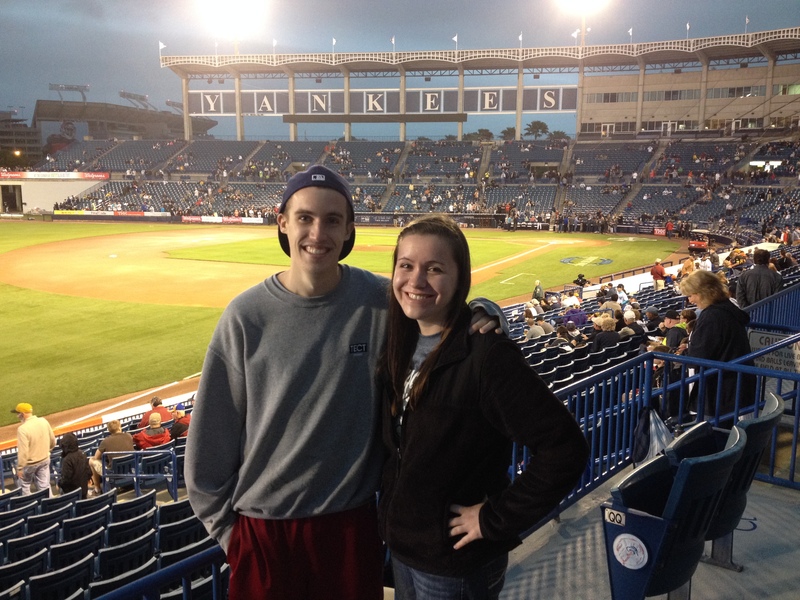 In the meantime though, a spring training game at George M. Steinbrenner Field was a great way to spend my spring break. Pulling into the parking area, it was apparent that baseball was in the air. From tailgaters to ticket scalpers, believe me when I say, people take this whole spring training thing quite seriously. The parking area was directly in front of Raymond James Stadium, the home of the Tampa Bay Buccaneers. Then to get to the baseball field, we crossed a pedestrian bridge over Dale Mabry Highway. 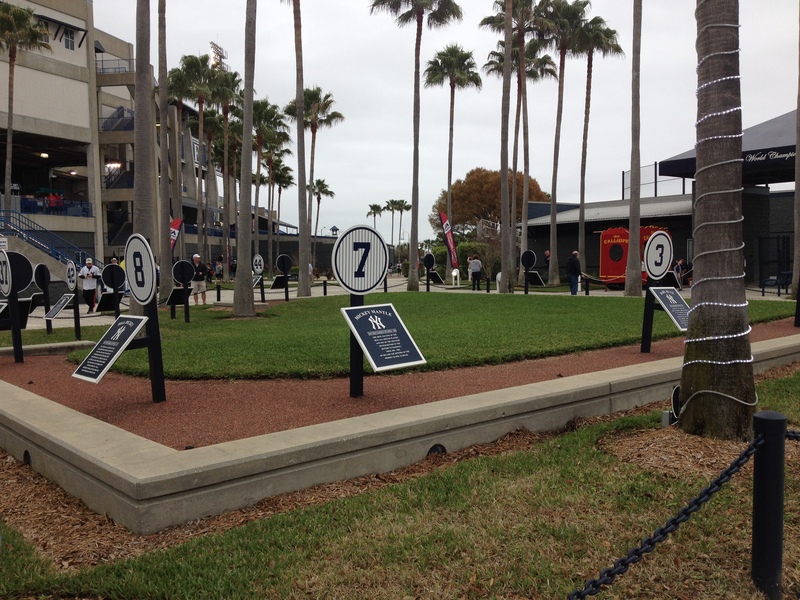 Before finding our seats, we meandered around outside the stadium for a short time, making stops to see the retired numbers of Yankee greats at the mini Monument Park, as well as the George M. Steinbrenner Statue. The city of Tampa became the first spring training site located in Florida when the Chicago Cubs setup camp in 1913. For years the city hosted different Major League Baseball teams during spring training, along with various minor league teams throughout the summer. Then in 1988, the Cincinnati Reds moved training facilities, and the following year, the last minor league team followed suit, leaving the city void of a baseball team and venue. An end to that spring baseball drought was announced in 1993, when the Tampa Sports Authority revealed a deal to build a new spring training facility for the New York Yankees. After a short debate over location, it was decided that the new complex would be built directly across the Dale Mabry Highway from Tampa Stadium, the home of the Tampa Bay Buccaneers at the time. On March 1, 1996, spring baseball was restored to the city when the Yankees hosted the Cleveland Indians. Today George M. Steinbrenner Field serves as home to the minor league Tampa Yankees, as well as the spring training location of the New York Yankees. From the time of inception, the new ballpark was named Legends Field. On March 27, 2008, that name was changed to George M. Steinbrenner Field, in honor of long-time Yankees owner and Tampa resident, George Steinbrenner. At the time, Steinbrenner was in failing health, and later passed away in July 2010. 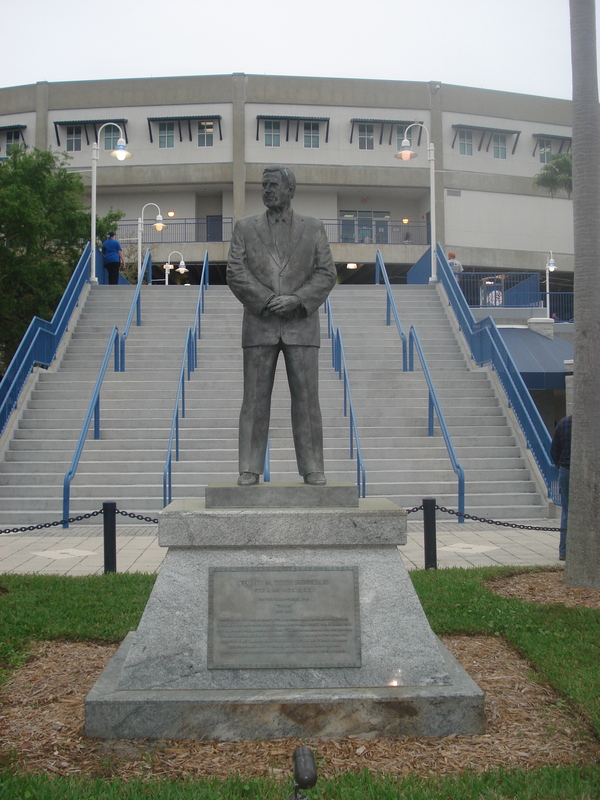 To further honor the illustrious owner, a life-size bronze statue was erected at the stadium’s entrance in January 2011. 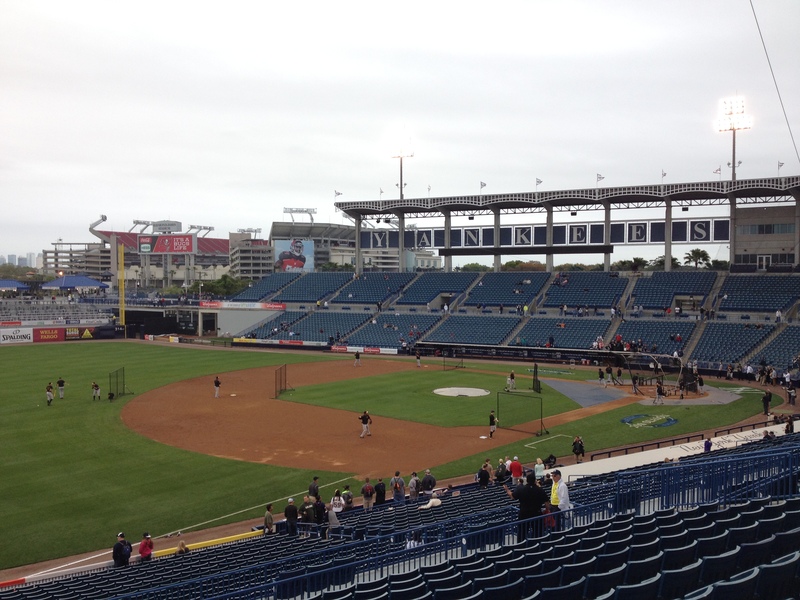 George M. Steinbrenner Field, with a seating capacity of 11,026, is an intimate venue when compared to its colossal Major League Baseball counterparts. 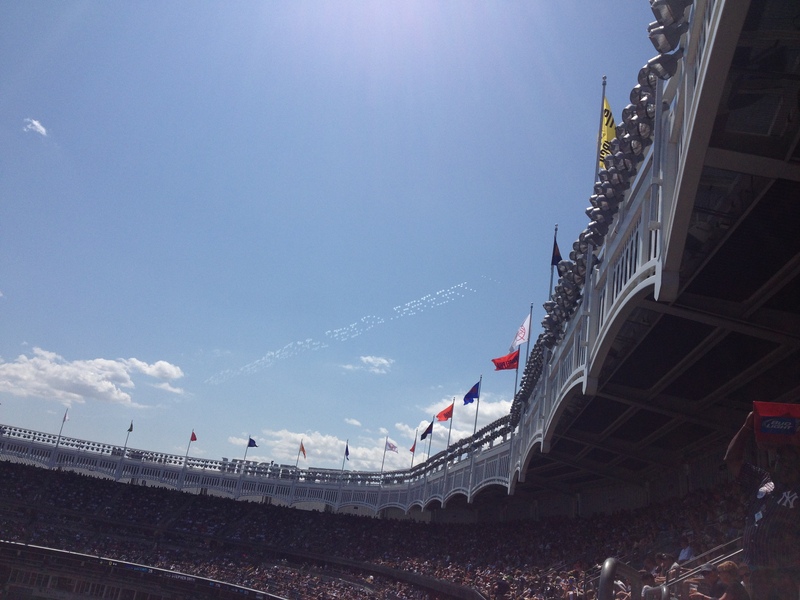 When visiting the ballpark, fans can catch subtle nods to the storied Old Yankee Stadium. The field dimensions of the stadium precisely mirror those of the former Yankees home. Also, the grandstand facade was designed after that of the legendary stadium. On this specific trip, my attention was slightly less focused on the actual stadium and more about the atmosphere. Spring training should be on the list of must-sees for every avid baseball fan. It gives you a chance to see veteran players in a lighter environment, alongside prospects fighting to make the team. Spring training allows fans to see players in all different stages of their careers. One of the most intriguing aspects of my visit was hearing a cacophony of boos as well as cheers raining down every time Alex Rodriguez’s name was announced. In years prior, that mixture would have been solely applause. Spring Training gives you a great preview of the regular season, and from what I saw in that one game, the 2015 season will be quite a spectacle. Aesthetically speaking, PNC Park, located on the north bank of the Allegheny River in Pittsburgh, Pennsylvania, is in a league of its own. Serving as the home of the Pittsburgh Pirates, the stadium’s design truly embodies the history and beauty of the surrounding city. Oriented towards the skyline and river, fans are treated to breathtaking panoramic views. I visited the stadium in the summer of 2009 for a matchup between the Indians and Pirates and was instantly blown away by the stadium’s pure elegance. I remember arriving in Pittsburgh hours before the game and leisurely strolling along the riverfront, exploring the stadium’s surroundings. Then before entering the stadium, we paused by the Roberto Clemente Statue, taking in its magnificence with the Roberto Clemente Bridge proudly standing in the background. 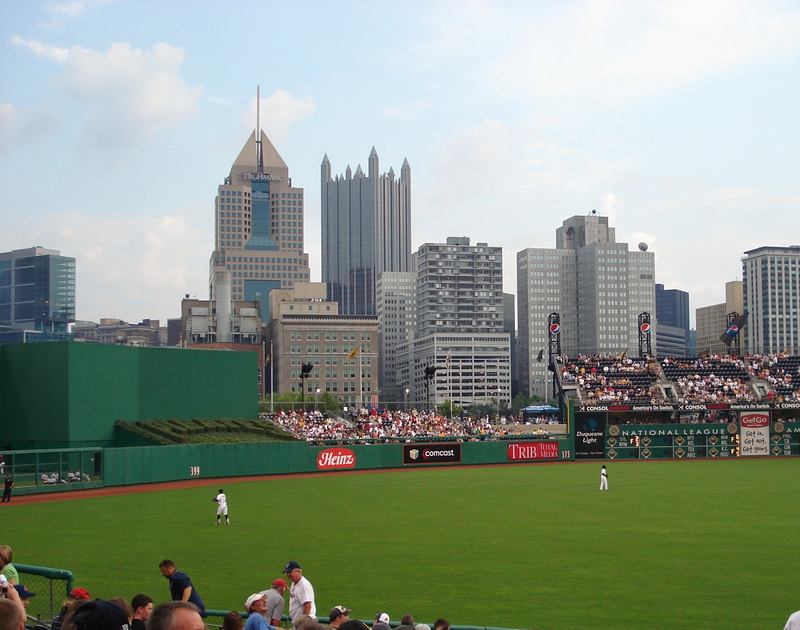 Conversation for a new baseball stadium in Pittsburgh gained momentum in 1991 when the mayor of the city, Sophie Masloff, proposed a new 44,000 seat ballpark. It was felt that the old park, Three Rivers Stadium, which had never been built with artistic tastes as a priority, had lost its accessibility and no longer could serve the organization’s needs. Despite the inherent need for a new stadium, discussions stalled for years until the team was purchased by Kevin McClatchy in 1996. In that same year, the new mayor of Pittsburgh, Tom Murphy, created the “Forbes Field II Task Force,” assigned with the responsibility of assessing the need for a new stadium, along with evaluating 13 potential locations. After the group decided on a location on the north shore of the Allegheny, and the ensuing political debate about funding was settled, construction began on April 7, 1999. 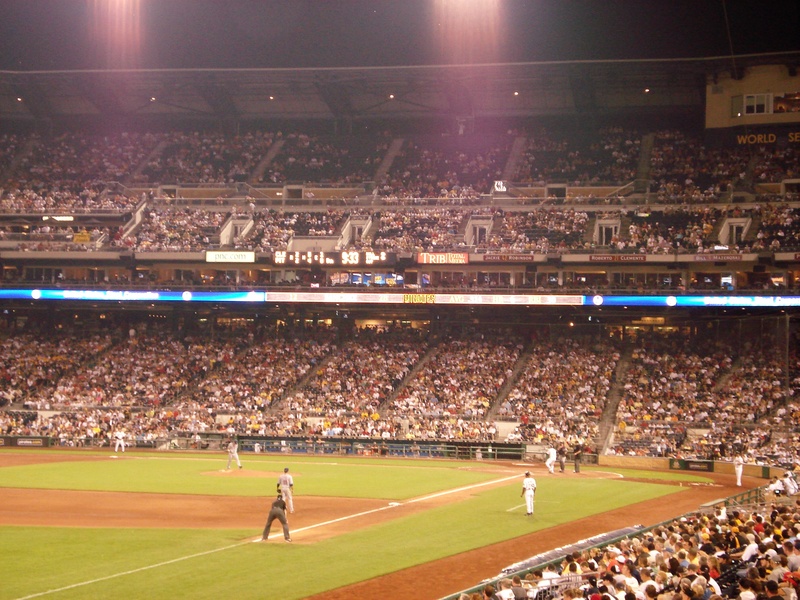 Construction lasted a short 24 months, allowing the Pirates to play their first official game at the new stadium on April 9, 2001, against the Cincinnati Reds. The stadium was designed by HOK Sport in a way to salute the classic style of Forbes Field, the Pirate’s home before Three Rivers was built. With masonry archways across the entry, steel truss work, and decorative terra-cotta pillars, the stadium truly delivers on its nod to the past. The relatively small stadium is an intimate, two-deck affair, and with the highest seat only 88 feet from the field, fans can expect a spectator-friendly experience. Roberto Clemente, one of the most fabled baseball players of all-time and a beloved figure in Pirate history, was used as a major component in the stadium’s design. Clemente was a Pittsburgh Pirate for 18 seasons where he became a two-time World Series Champion, World Series MVP, National League MVP, and amassed numerous all-star appearances, gold gloves, and National League batting titles. With an amazing career on the field, Clemente also made a large impact on his community, dedicating portions of his off seasons to charity work in his home country of Puerto Rico and other Latin American countries. When the thought of the new ballpark was just in its infancy, many fans shared a sentiment of wanting the stadium to be named in Clemente’s honor. Shortly after PNC Bank bought the naming rights to the stadium, the city of Pittsburgh renamed the Sixth Street Bridge the Roberto Clemente Bridge, in a compromise with fans. The stadium was then oriented to show off the bridge in its sweeping views of the skyline. The bridge closes down to vehicles on game days, transforming into a pedestrian walkway for fans taking them right past the Roberto Clemente statue outside the stadium. 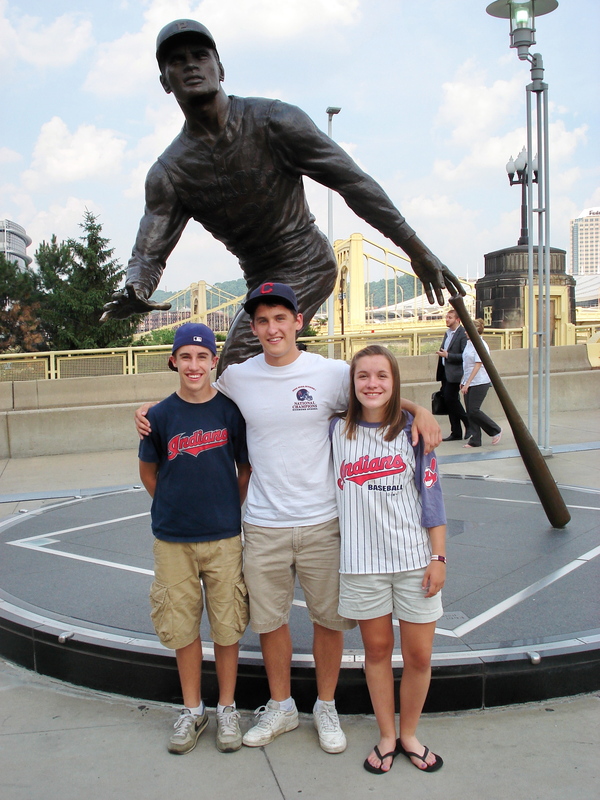 PNC Park also features statues of other Pirate greats Honus Wagner, Willie Stargell, and Bill Mazeroski. The base of the Clemente statue is shaped like a baseball diamond. Each “base” contains dirt from three of the fields where Clemente played: Santurce Field in Puerto Rico, Forbes Field, and Three Rivers Stadium. Another design element paying tribute to Clemente’s legacy is the right-field wall. The wall stands at 21 feet high, honoring the jersey number 21 worn by Clemente. Part of PNC Park’s allure comes from its ability to embrace the surrounding city along with the team’s history. While framing picturesque modern views, the stadium also allows players and traditions from the past to play an integral role in its identity. If you’re hoping to watch a baseball game surrounded by timeless beauty, PNC Park is the place to be. 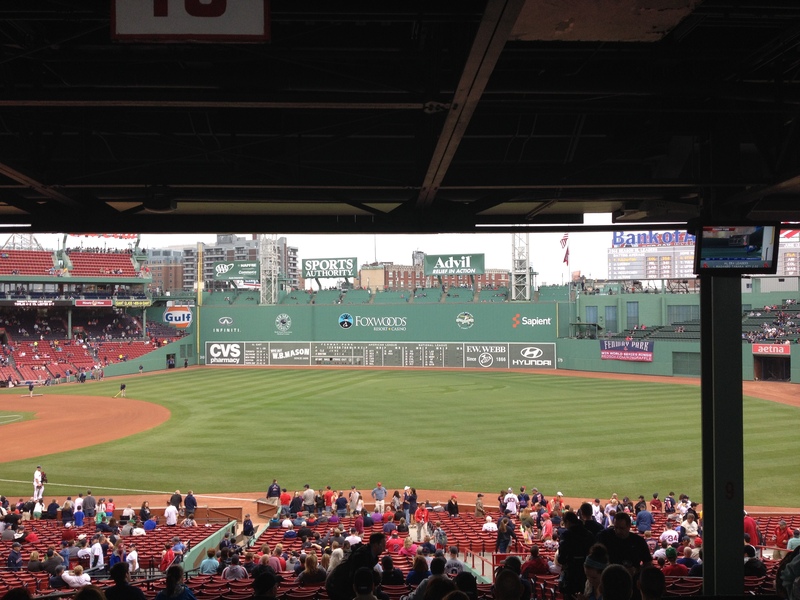 With spring semester starting today, I decided to take a look back at my most epic summer of baseball touring to date, which began with a bang in Boston, Massachusetts. Fenway Park has been at the top of my must-see list for years, and it was surreal to see the dream finally come to fruition this summer. I was like a kid in a candy shop on the morning of the game when we first saw the stadium and began our tour. At the start of the tour, we sat behind home plate to watch some of batting practice and then were able to come down on the field. On the field we were able to catch a glimpse of Cleveland Indians radio broadcaster Tom Hamilton, one of the best in the business and my absolute favorite. Hamilton was chatting with Boston manager John Farrel and managed a wave as we were passing by. 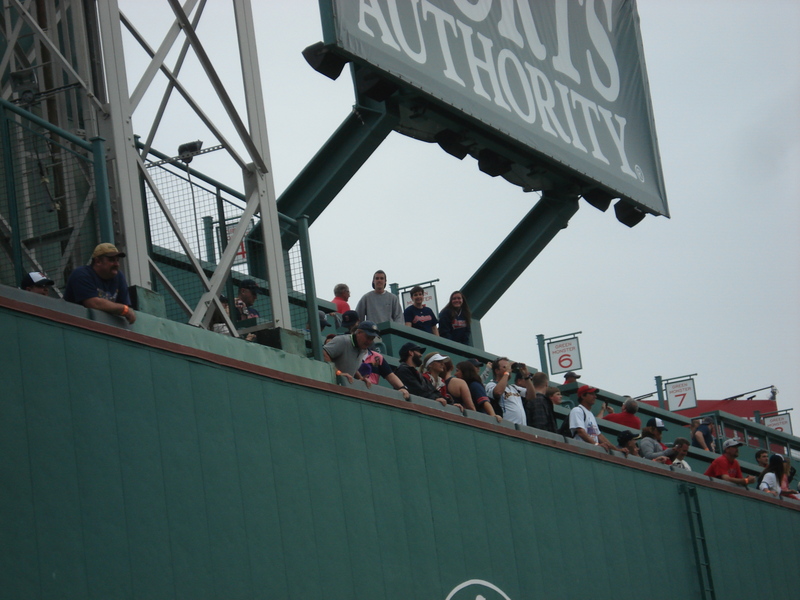 After that, we were ushered up to the Green Monster where we watched more batting practice. 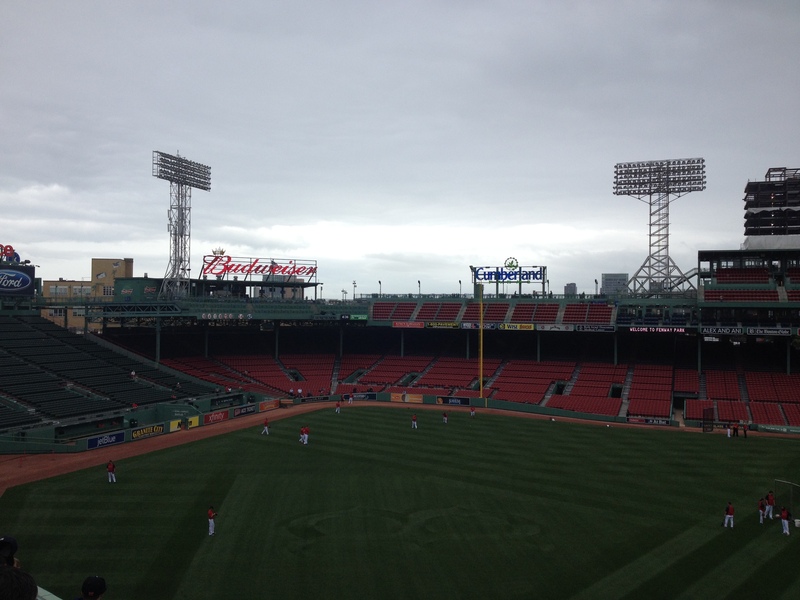 Watching batting practice from the Green Monster was probably the coolest baseball experience I have ever had. From the time I was a child, I always dreamed about sitting on the Green Monster and even wrote a letter about it in high school. Although it was just for batting practice, it still gave me chills. After our tour, we left the stadium and enjoyed a sausage on Yawkey Way. We reentered in time to watch the Indians in batting practice where we caught a David Murphy home run and then were thrown a ball by Indians reliever Cody Allen. The game hadn’t even started, and yet I was the happiest girl in the world. My favorite stadiums are the ones brimming with history and tradition. Fenway Park definitely fits under that category as it is the oldest Major League Baseball stadium still in use, and it maintains the same character and features synonymous with the Boston Red Sox. Just the atmosphere around the stadium is addicting and enough to bring a smile to the face of any baseball fan. How could the thousands of fans invested in and so passionate about their team and the traditions the team represents not warm your heart? The narrative of Fenway Park begins in 1911 when Red Sox owner John I. Taylor purchased a plot of land in “The Fens” of Boston to be the site of his new stadium. Construction for the stadium began in September of 1911 and took less than a year to complete. The first official game at Fenway Park was played on April 20, 1912 against the New York Highlanders (Yankees) and the new stadium proved to be good luck as the Red Sox went on to win the World Series that season. 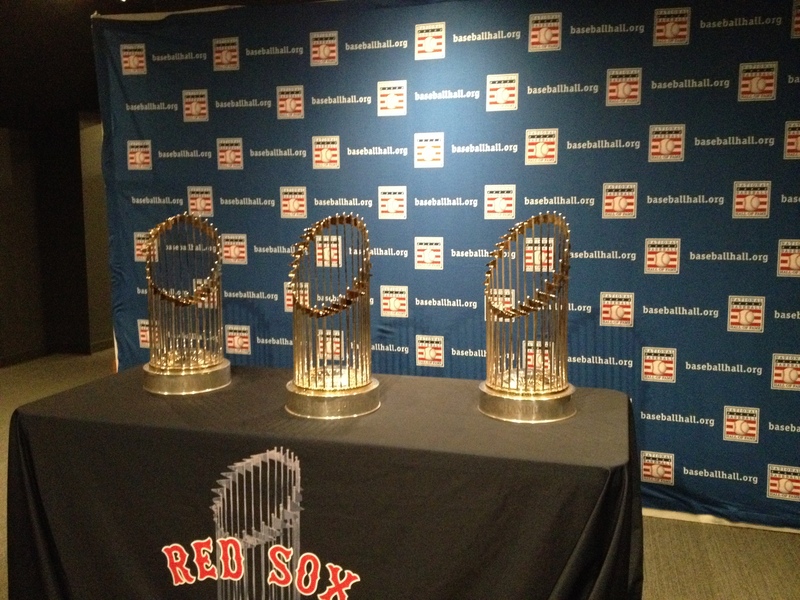 Since its inception, Fenway Park has hosted baseball, football, hockey, and even concerts. Countless memories have been made at the stadium by players, and fans alike. In the right field bleachers, 502 feet from home plate, lies the lone red seat. 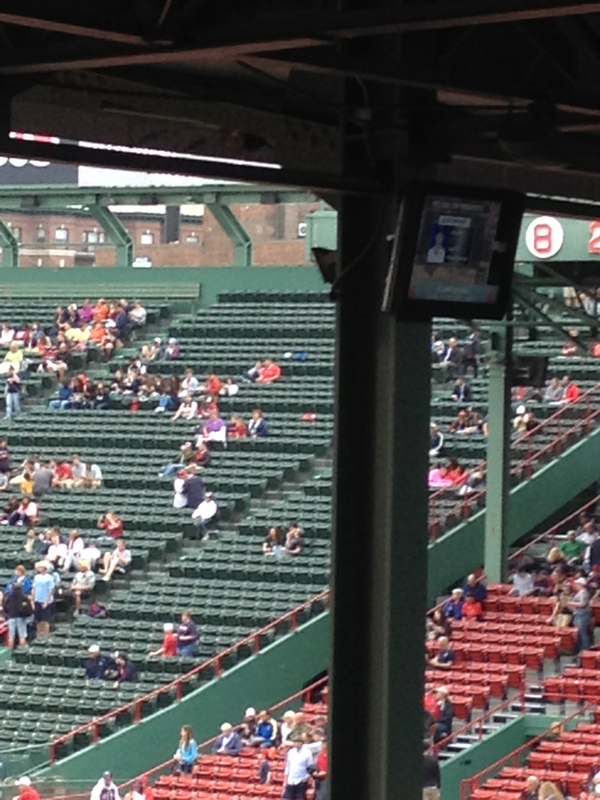 This seat, Section 42, Row 32, Seat 21, represents the longest home run ever hit at Fenway Park. The home run was hit by Ted Williams on June 9, 1946 and landed on the head of a fan. The seat was painted red to sit among the sea of green seats, commemorating this unrivaled feat. Looming at a height of 37.167 feet, stretching 231 feet across left field, 310 to 315 feet away from home plate, is the Green Monster, possibly the most iconic image of Fenway Park. 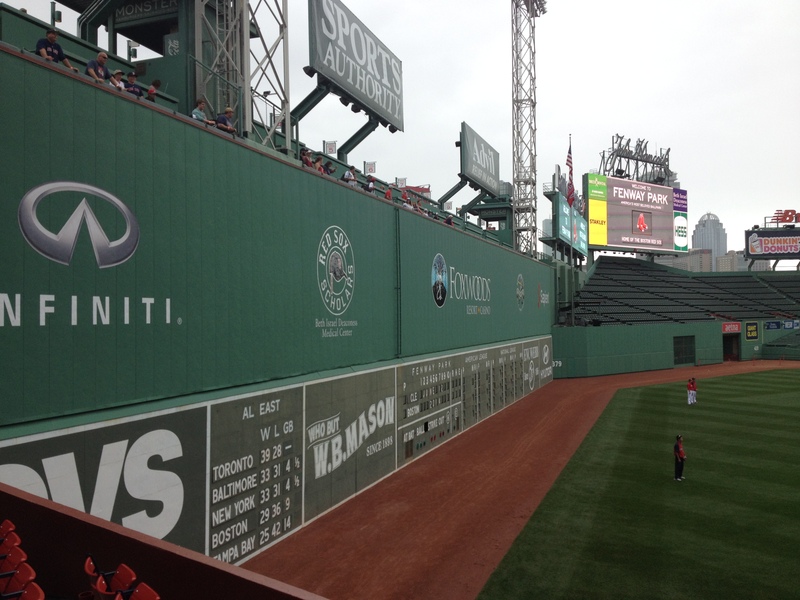 Although today we know it as the Green Monster, it had neither the name nor color at onset. When the stadium was built in 1912, “the wall” as it was referred to, was made out of wood and meant to block the view of people outside the stadium who had not paid for admission to the game. In 1934, the wall received a face-lift as the wooden fence was replaced with a concrete-and-tin wall. The Green Monster as we know it today, was born in 1947 when the advertisements were scraped off the wall and swapped for green paint. In 1975, the final change was made when a hard plastic took over for the tin. The shortest outfield distance in Major League Baseball finds its home at Fenway Park, in the form of Pesky’s Pole. Standing 302 feet from home plate, the right-field foul pole still presents a challenge for hitters as the fence sharply curves away from the pole. Pesky’s Pole was named after John Pesky, a long-time Red Sox short-stop and coach, who hit a number of his six home runs at Fenway Park around the pole. On Pesky’s 87th birthday, September 27 2006, the Red Sox officially dedicated the pole as Pesky’s Pole and placed a commemorative plaque to its base. To date, this trip and stadium remains one of my favorites. Not only does Fenway Park ooze with tradition, but all of Boston holds numerous jewels of American history. Not to mention the delicious authentic Bostonian cuisine. There’s just something about Fenway Park, an aura that beckons you inside, causing you to never want to leave. Once you’ve tasted what its atmosphere is like, you can’t stop counting down the days until you can return. Before the Reds’ Great American Ballpark and the Bengals’ Paul Brown Stadium, both teams shared Cinergy Field, formerly and more commonly referred to as Riverfront Stadium. This was in the “cookie-cutter” stadium era, when it was common for football and baseball teams to share occupancy of a venue. In the 1990s after 20 years of sharing, both the Bengals and Reds felt the stadium lacked needed amenities, and lobbied for new stadiums. Their wish came true, when in 1996, Hamilton County voters approved an increased sales tax to fund the construction of both venues. After two possible locations for the new baseball stadium were proposed, citizens settled the debate in 1998 by voting in favor of construction on the riverbank in an area called the “wedge”, between Riverfront Stadium and US Bank Arena. After agreeing to a lease with the city, the Reds broke ground on October 4, 2000 and played their first game in the new stadium on March 31, 2003 in front of a sellout crowd. The Gap is an actual 35 foot-wide break in the second and third decks, between home plate and third base. This opening, aligning perfectly with Sycamore Street, allows a view from downtown through the ballpark toward the Ohio River, and also frames a view of the city for those in the stadium. The Gap is bridged by a walkway on each level that offers fans a great view of the ballpark, or of downtown. Pete Rose, the all-time Major League hits leader and one of baseball’s most well-known figures, is the inspiration behind a number of features at the stadium. Rose was caught betting on his teams’ games as a manager and was subsequently banned from baseball and the Hall of Fame, although he still remains a staple in Reds history. Debates rage on about whether he should or will ever be allowed to enter the National Baseball Hall of Fame. Two smokestacks located in right-center field pay tribute to Rose’s legendary career. The smokestacks, embodying the steamboat heritage of the region, are each made from 7 bats, symbolizing Pete Rose’s No. 14 jersey that major league baseball restricts the Reds from displaying with the other Cincinnati legends. The smokestacks also serve as added entertainment for the crowd by lighting up, and shooting flames and fireworks after Reds victories and home runs. In addition to the smokestacks, a rose garden in honor of Pete Rose is located adjacent to both the stadium and museum, in the vicinity of where his record-breaking 4,192nd hit landed in the old Riverfront Stadium. In front of the main entrance of Great American Ballpark is a monument built to honor historic Crosley Field, the home of the Reds from 1912 to 1970. Crosley Terrace consists of statues of Crosley-era greats Joe Nuxhall, Ernie Lombardi, Ted Kluszewski, Joe Morgan, Johnny Bench and Frank Robinson, depicted playing a game of baseball. Grass in that area is even sloped to match the incline of Crosley’s outfield. For me, the history and symbols are the most valuable part of a stadium. Although Great American Ballpark may not have the lavish history of ballparks like Fenway and Wrigley, it finds ways to incorporate objects and tokens to remember and honor the great moments, players, teams, and stadiums of the past. Someday it will be considered ancient and house traditions and memories integral to baseball’s past, but until then, you can take in some elements of Reds history while watching boats traverse the great Ohio River. 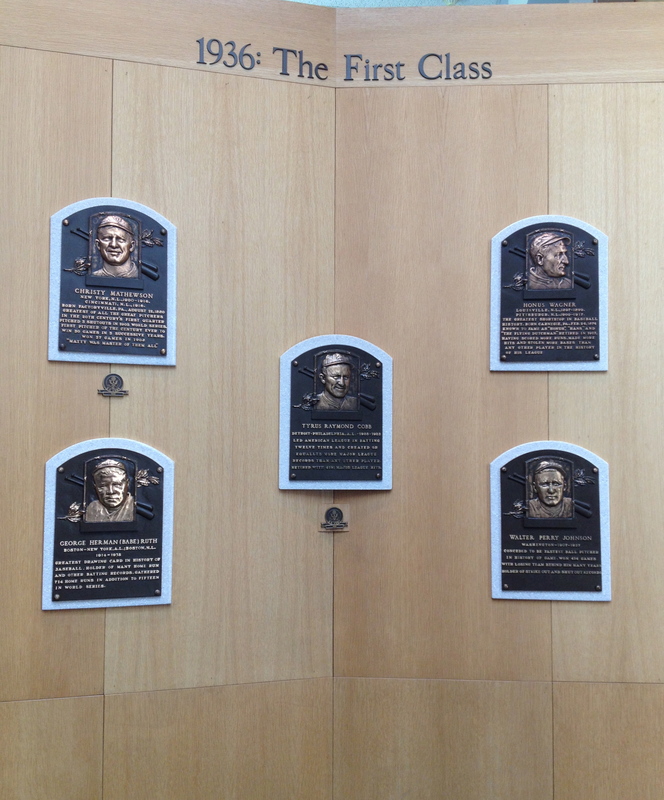 With the announcement of the 2015 Hall of Fame class today, let’s take a closer look at the rich tradition that is the Baseball Hall of Fame. 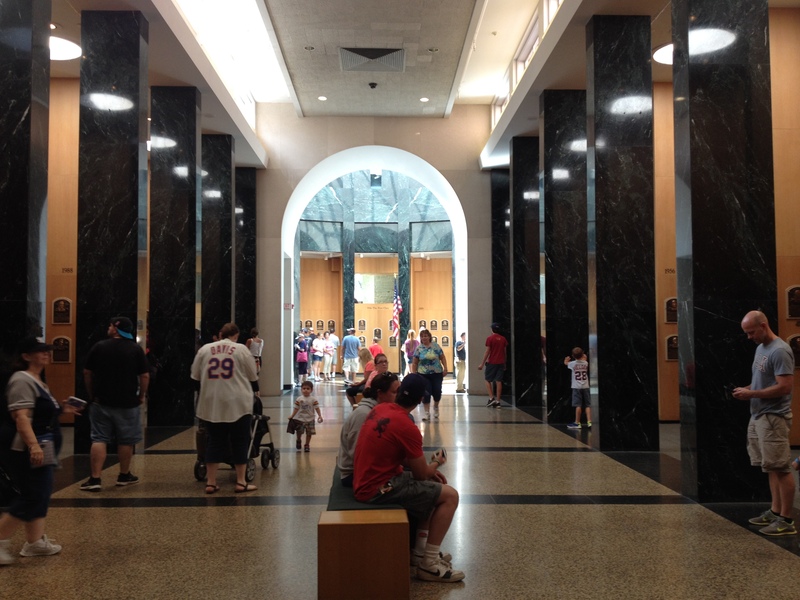 Sometimes referred to as strictly Cooperstown, the National Baseball Hall of Fame and Museum located in Cooperstown, New York, was the next stop on my family’s summer baseball adventure. 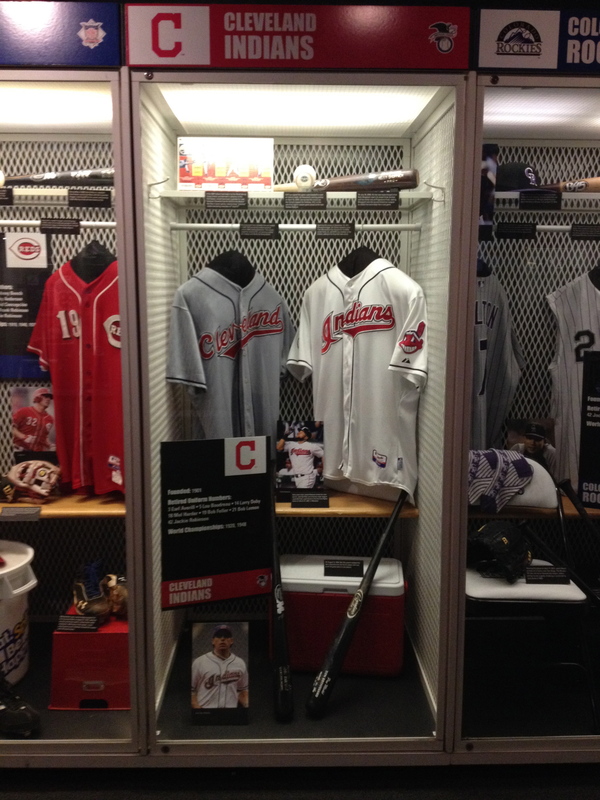 With the motto “Preserving History, Honoring Excellence, Connecting Generations,” the Hall of Fame is an educational institution housing artifacts and exhibits related to the sport of baseball. Serving to honor the game and the individuals who impacted the game, the Hall of Fame with the history it preserves, should be a priority for any baseball enthusiast, or casual fan. 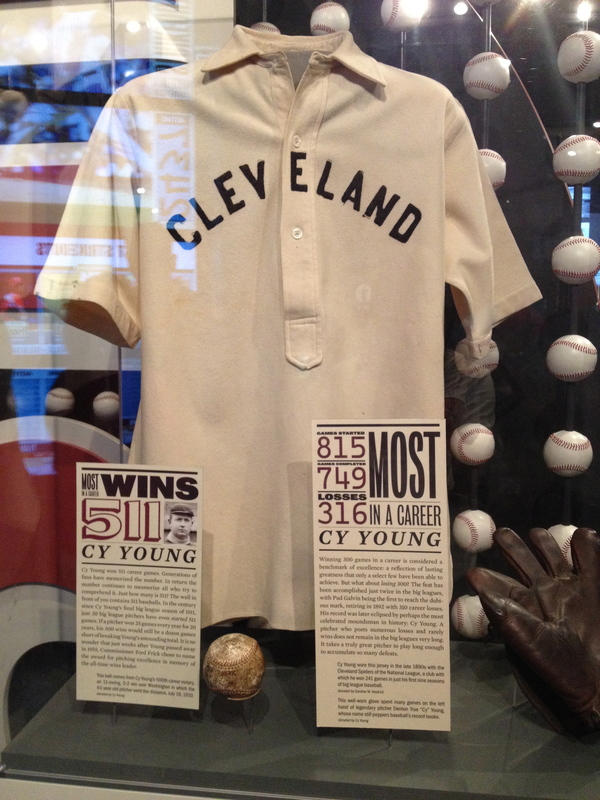 This was my second trip to the Hall of Fame and although special with 2014 being the 75th anniversary of the museum, I still only managed to scratch the surface of the abundance of information, stories, facts, and overall history the museum has to offer. The beginning of the National Baseball Hall of Fame and Museum can be traced back to the 1908 report published by the “Mills Commission,” a committee tasked with determining the origins of baseball. The report stated that baseball was invented in 1839 by Abner Doubleday in Cooperstown, New York. This would eventually be found false, but the report proved to be fuel for the creation of the Hall of Fame. In 1935, Stephen C. Clark, a Cooperstown resident, purchased an old baseball that had been discovered in a farmhouse attic near Cooperstown. Clark bought the ball, soon to be known as the “Doubleday Ball,” for $5 and placed it with other memorabilia on display in the town’s Village Club. This exhibit became a big hit, prompting Clark to approach the president of the National League, Ford Frick, with the prospect of a National Baseball Museum. Frick fully embraced the idea and even suggested a Hall of Fame for the greats of the game to be included with the museum. Now the idea had funding, support, and legitimacy allowing plans for the museum to move along. The inaugural induction class of Ty Cobb, Walter Johnson,Christy Mathewson, Babe Ruth, and Honus Wagner was announced in 1936, after being voted on by members of the Baseball Writers’ Association of America. The five charter members each received over 75% of the votes cast, which holds today as the standard for induction. The Hall of Fame now consists of 310 elected members. 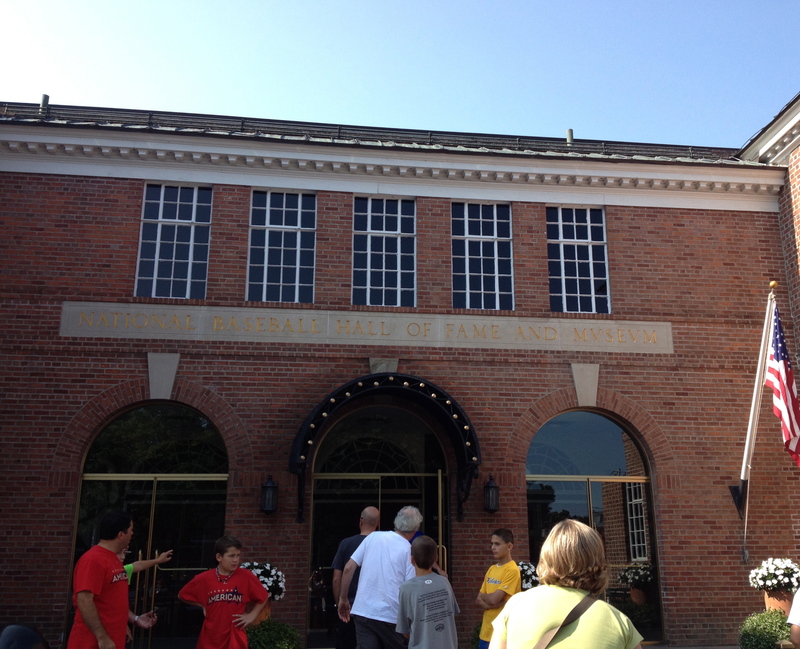 The National Baseball Museum opened in 1938 and was officially dedicated June 12, 1939. By the time of the dedication in 1939, twenty-five men had already been elected to the Hall of Fame. At first glance, or after hearing analysts discuss the Hall of Fame voting procedure and the changes made throughout the years, it may seem rather overwhelming. It also is hotly debated as just today after the 2015 induction class announcement, analysts on ESPN expressed their frustration with the current ballot and how they felt they were forced to leave worthy candidates off, because there were simply not enough slots. Currently, votes are cast annually by members of the Baseball Writers’ Association of America (BBWAA) with at least 10 consecutive years on a baseball beat. Each qualified member of the BBWAA can vote for up to 10 players from the ballot. 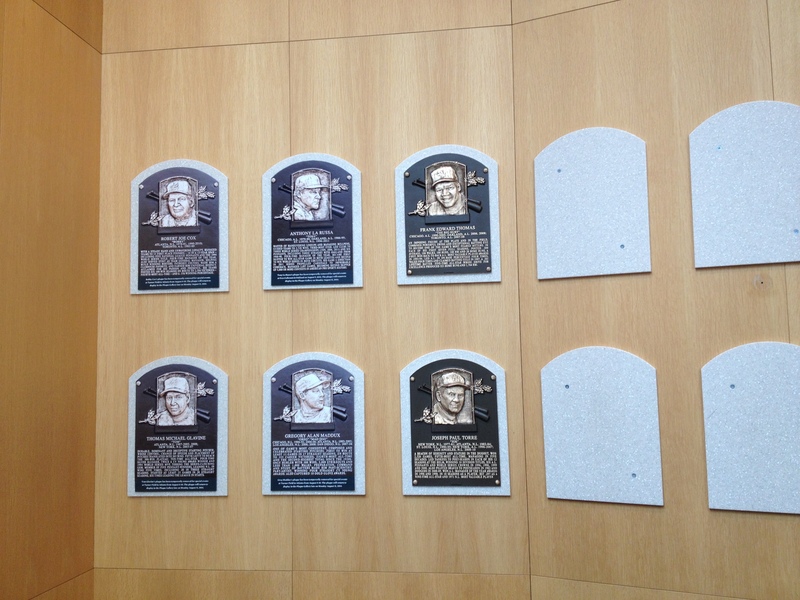 The ballot consists of pre-selected players who played for at least 10 seasons and have been retired for at least 5. Players receiving 75% of the cast votes will be elected to the Hall of Fame, while players receiving fewer than 5% will be removed from future ballots. Previously, if a player had appeared on the ballot 15 times without being elected, they would also be removed from the ballot, but in 2014 the rules were amended to only allow 10 years of consideration. In addition to the BBWAA selection, there are also Eras Committees that review players no longer considered eligible by the BBWAA, along with managers, umpires, and executives, who made an impact on the game in one of three eras. The eras include, Golden, Pre-Integration, and Expansion. The voting for each era is staggered, so only one will occur per year. The ballot consists of 12 individuals and the electors may vote for as many as 5 candidates. Those receiving at least 75% will be elected to the Hall of Fame. The Hall of Fame class of 2015 announced today consists of Randy Johnson 97.3%, Pedro Martinez 91.1%, John Smoltz 82.9%, and Craig Biggio 82.7%. This is the first time since 1955 that the BBWAA elected 4 players to the Hall of Fame in the same year. The 4 inductees will be honored as part of the Hall of Fame’s Induction Weekend July 24-27 in Cooperstown, New York, with the actual induction occurring July 26. Now that we have learned about the history of the Hall of Fame and the voting process, let’s look at what the Hall of Fame actually is. Since the Hall of Fame suggests visitors start on the second floor, that’s where we will begin our tour. Now that you have had a brief summary of the National Baseball Hall of Fame and Museum, I hope that you’ll be planning your trip soon, so you can truly appreciate the magnificent home of baseball. 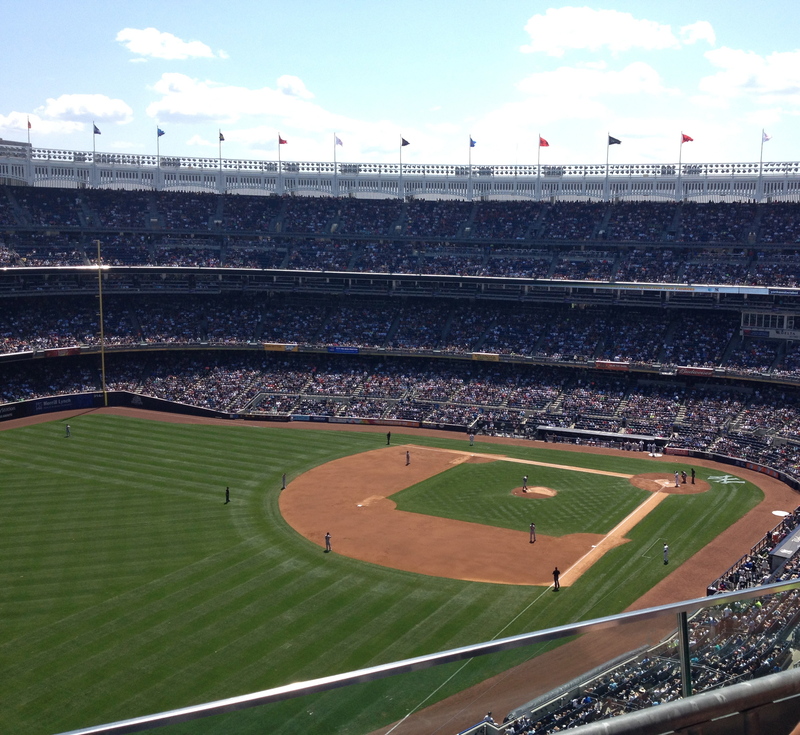 To wrap up this summer, my family planned a spur of the moment weekend trip to New York to see New Yankee Stadium. That trip will go down in history as one of my favorite stadium visits of all time. The atmosphere at Yankee Stadium could not be compared to anything I have ever witnessed. Even with a subpar team on the field, the stadium was packed with passionate New Yorkers cheering at every opportunity possible. Although Yankees fans are always known as being some of the most intense fans in the league, a major factor contributing to the atmosphere was Derek Jeter’s final season. No matter your favorite team, you can’t argue with the legacy left by Derek Jeter. I might cringe a little inside every time I hear his name, but I have the utmost respect for Jeter as a person and as a baseball player. The reception Jeter received at the game was unrivaled by any other. During the game, Jeter recorded his 3,431st hit. With that hit, he moved to sixth place on the all-time hits list, passing the great Honus Wagner. This was truly a moment that I will remember forever. The stadium erupted as if the Yankees had just won the World Series and chants of “Der-ek Jet-ter” rained down for what seemed like an eternity. Although I of course was rooting for the Indians that day, I couldn’t help but smile at the excitement and the little part of history I was a part of. Derek Jeter is one of the all-time greats of baseball and just to be able to watch him play was an amazing experience. This holds an especially big significance for my generation. Jeter was that household name that you could ask any kid about and they would know who you were talking about. Everyone wanted to be just like Derek Jeter. It is crazy to think that he will not be playing another season, but it is also a great honor to have witnessed his talents for my whole childhood. Here is a video I took after Jeter’s 3,431st hit. You can still hear the remnants of the cheering even as the next batter steps into the box. https://www.youtube.com/watch?v=GBQ0BBdF9oc Now that I got that sappy moment all taken care of, let’s take a closer look at the other aspects that make Yankee Stadium unique and memorable. Anther facet of Yankee Stadium that makes it a must-see is the crazy, devoted, rambunctious, section of the stadium referred to as “The Bleacher Creatures”. In old Yankee Stadium, the Creatures’ home was section 37 and 39. Now in the new stadium, they occupy section 203 in the right-field bleachers. The origin of this passionate group is said to be traced back to the 1980’s and 1990’s when a fan named Ali Ramirez would show up to games ringing a cowbell. Around this time, fans in the bleachers would begin to chant the names of Yankees players. During a game in the early 90’s, the Creatures were chanting the name of Tino Martinez, the Yankees first baseman. Martinez turned around and waved to the fans. This began the first inning ritual of going around the field chanting the names of the players. Some players wave while others have unique gestures. It was such a cool thing to witness. The name “Bleacher Creatures” was given to the group by Filip Bondy, a columnist for the New York Daily News. Bondy spent a whole season with the section gaining research for his book titled Bleeding Pinstripes: A Season with the Bleacher Creatures of Yankee Stadium. Seeing grown men with so much excitement about baseball just has a way of warming the heart. How organized and united the group was blew my mind. Along with supporting their own team with different chants throughout the game, the group also has a tradition of heckling the opposing team’s right fielder. This sometimes has gotten the group in trouble for some offensive things they have said, but overall the tradition of the Creatures is one for the ages. You can hear stories about this group, but the stories can’t do justice to seeing this spectacle in person. When the plans to build a new Yankee Stadium were released in 2005, they were met with a wide spectrum of emotions. Some diehard fans felt it was a crime to demolish the old stadium with all the years of tradition it contained. Others were upset about the financial side of the new plans with it’s tax-exempt financing, while yet others disliked the fact it would be built overtop of two city parks. Still others felt blindsided by the announcement because the plans were approved without public consent. And then there were fans who were excited about the new stadium and the potential for new memories to be created. Even with opposition the plans went through, and the groundbreaking ceremonies for the new stadium took place on August 16, 2006, the 58th anniversary of Babe Ruth’s death. The construction lasted through the 2007 and 2008 seasons, with 2009 being the stadium’s inaugural season. 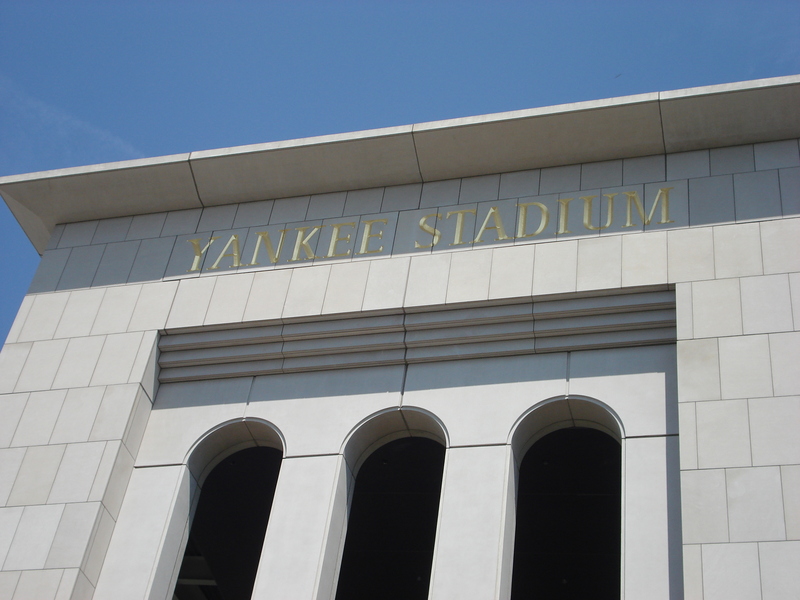 Built across the street from the old stadium, New Yankee Stadium, incorporates many of the old design elements in an attempt to preserve the history. The exterior was modeled after the old stadium’s exterior and also, some of the seating layout was planned to mimic that of the old. One of the most iconic features of Old Yankee Stadium was the frieze along the roof with the different flags of the MLB teams. The replica of that frieze is one of the first elements that you notice in New Yankee stadium. That frieze will always be synonymous with the Yankee pinstripes in my mind. Overall, the stadium has a very clean, fresh look while drawing in legendary components from the past. With the old stadium demolition, a baseball field and park now stand in it’s place. Called Heritage Field, this park is intended to pay homage to Yankee greats and historic moments from the old stadium, while also returning parkland to the residents of that area. My family took the subway to the stadium, so we walked right through the park. On the walkway, there are pavement stones engraved with historic dates and moments in Yankee history. 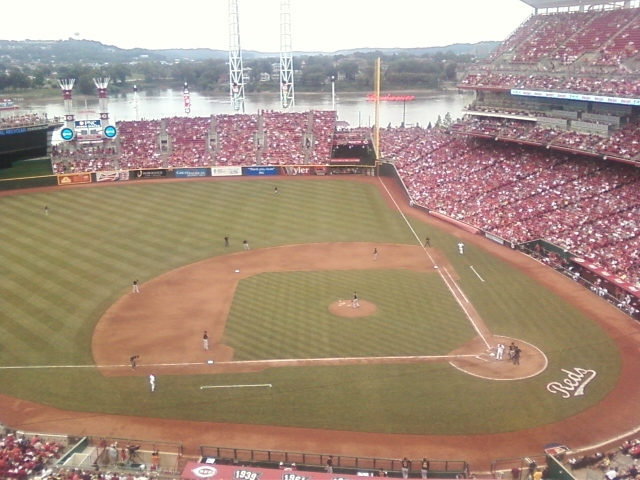 The field is made up of three baseball fields that teams have to apply to play on. 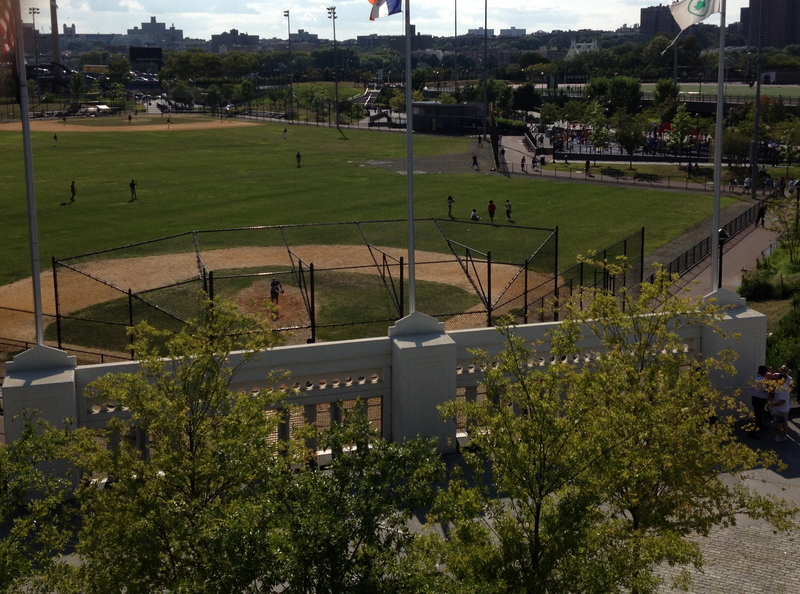 One of the fields sits on the spot of the Old Yankee Stadium field. Also, a 12-ton portion of the old stadium frieze remains on the site. It is neat to see how the city worked to preserve some of Yankee history in the park design. After visiting both the old and new stadiums, I have a newfound appreciation of tradition. While some of the most storied moments in baseball took place at old Yankee Stadium, they were not forgotten or demolished with the stadium. They live on in the hearts of fans and in small, yet profound details in the new stadium, waiting for new memories and traditions to be made. I guess you could say Derek Jeter already took the liberty of manufacturing a few moments of his own to be written into the pages of baseball’s history books. 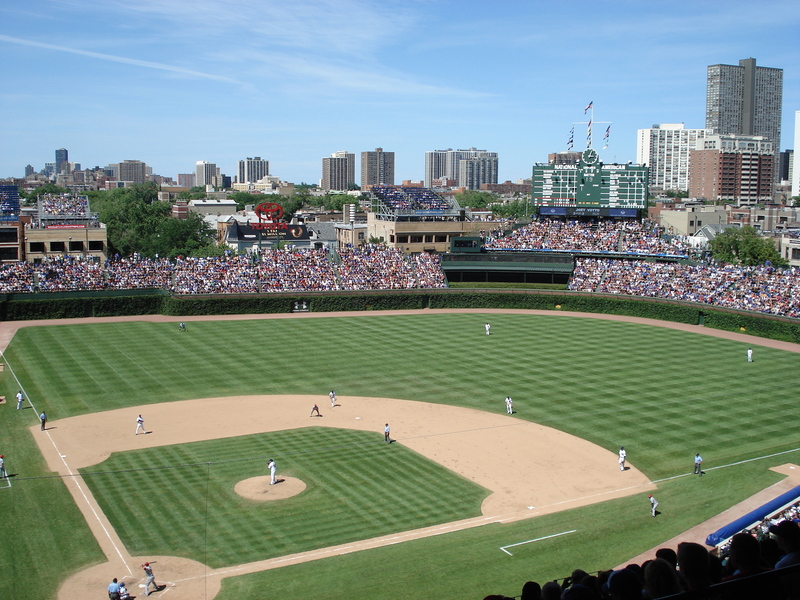 Wrigley Field, nicknamed The Friendly Confines, is a “must see” when it comes to baseball stadiums. The ballpark oozes with history and tradition while the surrounding town radiates class and sophistication. Sporting unique features like an ivy wall, manually operated scoreboard, and rooftop seating, Wrigley Field immerses the spectator in an unparalleled experience, uniting the past and present. Originally named Weeghman Park, Wrigley Field was built in 1914 to house the Chicago Whales, a baseball team belonging to the Federal Baseball League. The stadium at the time cost $250,000 to build. When the Federal League folded two years later, Charles Weeghman, the former Whales owner, joined William Wrigley Jr. and others to purchase the Chicago Cubs. He then immediately moved the team to the young ballpark. The first game played by the Cubs in Weegham Park was on April 20, 1916. After Wrigley purchased the team from Weegham in 1920, the stadium was renamed Cubs Park, and then in 1926 it was given the name Wrigley Field in honor of William Wrigley. When you think of Wrigley Field, what comes to mind? The Cubbies, Wrigleyville, maybe some specific memory? For me it boils down to five things, the marquee sign outside the stadium, the surrounding rooftop seating, the manually operated scoreboard, the ivy, and most importantly, the loyalty of fans. All the unique features of the stadium help to enhance a fan’s visit, but the experience is truly made by the passionate fans supporting their team. The surrounding rooftop seating adds to the friendly, relaxed atmosphere of the stadium. It is an awesome idea and serves as a representation of how the community supports and interacts with the Cubs organization. The rooftops are such a cute addition to the stadium and the people on them looked like they have an amazing time. Getting seats on one of the rooftops is definitely on my bucket list! The manually operated scoreboard is one of the last remaining of its kind in baseball. Mounted above the bleachers in centerfield, it has never been hit by a baseball. The scoreboard was installed in 1937 when the bleachers were added. It has thus far stood the test of time, only undergoing minor additions. In 1941, the clock was added above the scoreboard, and then more lines for scores, and a small electronic message board followed suit in years to come. Scores are sent in to the scoreboard operator who is stationed in the scoreboard. That person then by hand replaces the numbers to update scores. It is awesome to watch and a very refreshing reminder of the “old days.” Above the scoreboard are three flagpoles, one for each division in the National League. On the poles are 15 flags, representing each of the teams. Their order reflects the current standings of the teams in each division. There have recently been talks about possibly demolishing the scoreboard and adding a jumbotron. Only time will tell the fate of this historic landmark. You all have probably seen the commercial for State Farm Insurance last year where Kerry Wood pulls Andre Dawson from the ivy covering Wrigley’s home-run walls. That ivy is a staple of the stadium. You might have noticed during the first couple weeks of the baseball season that the ivy looked dead. No need to worry, it appears that way until further into spring when the leaves have a chance to grow out. The ivy, a mixture of Boston Ivy and Japanese Bittersweet, was planted in 1937 by the General Manager of the Cubs at the time Bill Veeck. The ivy, an idea modeled off of Perry Stadium in Indianapolis, was meant to “beautify” the bleachers that had been rebuilt that year. 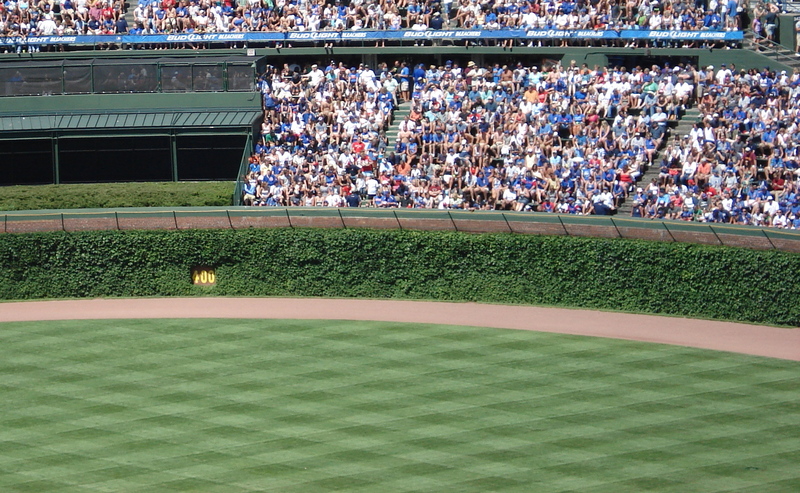 Wrigley Field is the only current professional baseball park with ivy-covered outfield walls. 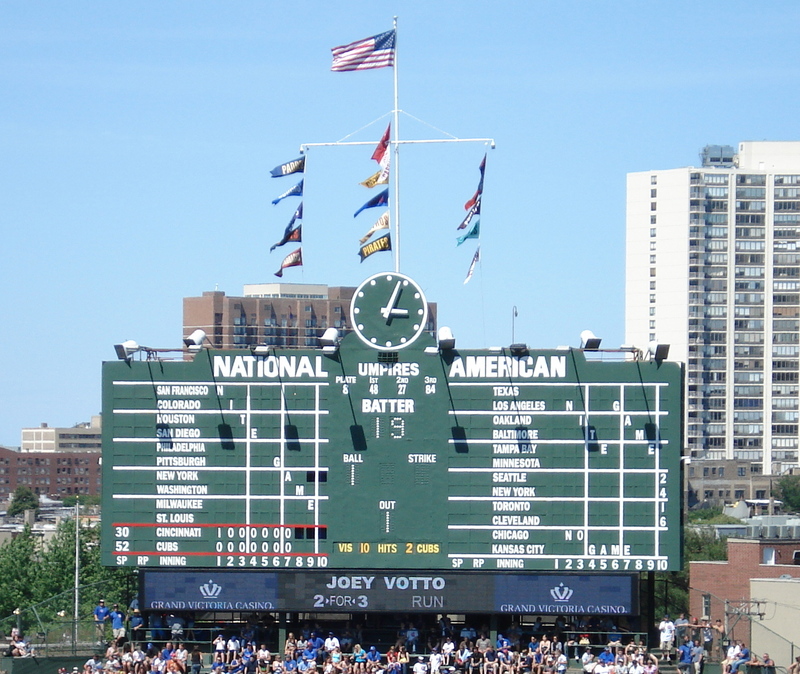 While Wrigley Field serves as the setting and star of baseball games on afternoons in the summer, it also has played an important role in many well-known movies and tv shows. 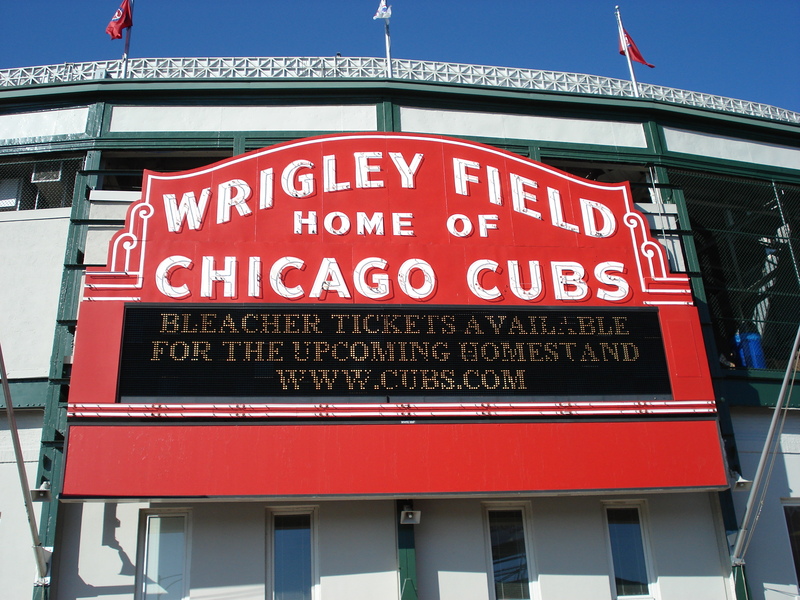 In addition to baseball and the big screen, Wrigley Field has housed football games, soccer matches, the hockey Winter Classic, and many concerts. It has been a witness to some of the biggest feats in the game of baseball. One of the most popular moments happened in game 3 of the 1932 World Series. The Colossus of Clout, The Sultan of Swat, The King of Clash, The Great Bambino, yes….Babe Ruth was up to bat. The story says that Ruth pointed to the outfield and on the next pitch, launched a home run to that same spot. Although in reality it is unknown where and what Ruth was actually pointing at, “calling your shot” is credited to this monumental statement. As a baseball fan, it is a wonderful opportunity to visit the stadium and take part in such a rich tradition. 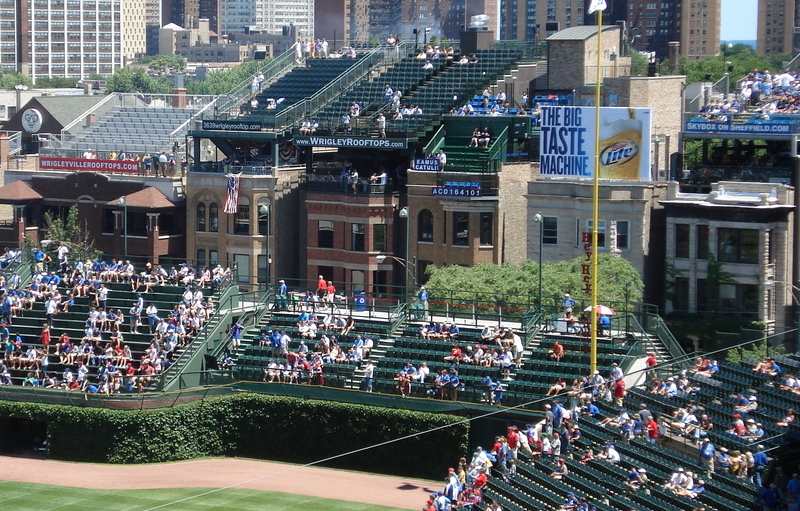 Wrigley Field should be near the top of every baseball enthusiast’s list of stadiums to visit. Kauffman Stadium, home of the Kansas City Royals, is known as one of the most beautiful stadiums in all of Major League Baseball. While being visually alluring, the stadium also boasts a rich tradition, standing as the sixth oldest active stadium. The plan for Kauffman Stadium began in 1967 when Jackson County approved the building of a baseball stadium for the Kansas City Athletics and a football stadium for the Kansas City Chiefs. It was unusual in that time period to build two separate stadiums and many critics believed that two stadiums could not be supported. Then before the 1968 season, the Athletics were moved to Oakland. Responding to outrage in the Kansas City area, the MLB granted expansion franchises to multiple cities including a Kansas City team, owned by Ewing Kauffman. These teams were set to begin play in 1971, but the starting season was moved up to 1969 due to pressure from the cities. Jackson County continued planning the new park, and Royals Stadium opened on April 10, 1973. This provided a new home for the Kansas City Royals who had played the franchises’ first four seasons at Kansas City Municipal Stadium. 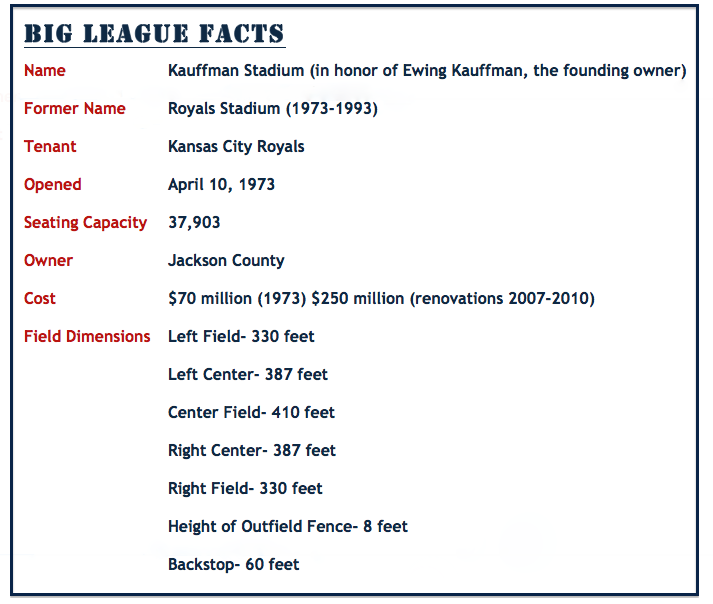 In a ceremony on July 2, 1993 the ballpark was officially renamed Kauffman Stadium in honor of Ewing Kauffman. The stadium remained relatively unchanged for years until 1900 when a jumbo-tron video screen was installed. Then, before the 1998 season, the astroturf was removed and the field was resurfaced with grass. By 2000 blue seats were installed in the stadium, replacing the original orange ones. Lastly, in 2007 a $250 million two-year renovation plan was unveiled, making vast improvements to the stadium. Did you Say Free Donuts?? I visited Kauffman Stadium in 2003 with my family during a visit to my dad’s cousins. I fell in love with the stadium’s design. It had an elegant look, but the atmosphere was relaxed and fun-loving. The fountain and waterfall display behind the home run fence was the coolest thing I had seen in a baseball stadium. Also, the crown scoreboard, from my perspective as a young girl, was absolutely breathtaking. While the architecture was quite magnificent, my favorite part of Kauffman Stadium was the donut promotion. The Kansas City Royals began a Krispy Kreme Donut promotion in 2003. If the Royals recorded 12 hits, each ticket for that game could be redeemed for a dozen Krispy Kreme Donuts. That’s right, each fan could receive a donut per hit if the 12 hit mark was reached. It seems crazy, but this promotion lasted through the 2006 season. At the game we attended, it just so happened that the Royals recorded 12 hits. Never have donuts been more delicious than those free ones. This is a picture taken from the front of Kauffman Stadium. This year, Kauffman Stadium celebrates its 40th season. Since 1973, The K has hosted over 70,638,469 fans, two all-star games, three no-hitters, playoff games in seven seasons, and two World Series. Those statistics don’t even begin to describe the countless pitches thrown, hits recorded, or hours of baseball played. Most importantly, those numbers can’t account for the priceless experiences had at the stadium. 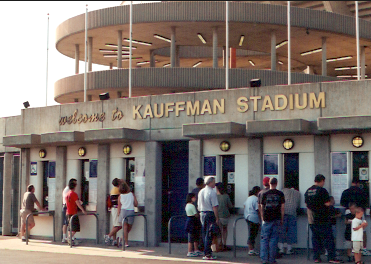 Kauffman Stadium has thus far stood the test of time, making an impact on anyone entering the gates. Indians tickets I saved from some of the games I attended. Progressive Field, formerly known as Jacob’s Field will always be my favorite major league baseball stadium. Yes, I am a tad biased, but the ballpark contains many memories from my childhood. There was the time when I attended a game and received a home run ball hit by Jim Thome, from an amazing usher who works with my dad. Better yet, CC Sabathia signed that ball for me after the game. I will never forget the feeling of pure elation as CC took the ball from my tiny hands and signed it. It was a surreal experience, cementing my love for CC Sabathia. Or there was the time when that same usher took me down to the front row of the stadium, right behind the on-deck circle. Needless to say, I had the best view available!!! And then adding to my memories are the countless hotdogs consumed during dollar dog nights, the numerous bobblehead afternoons, summer night fireworks, rain delays, and opening days. There will never be a baseball stadium that replaces Cleveland’s stadium in my eyes. When hearing the name John Adams, most of America instantly thinks of the second president of the US. In Northeast Ohio, the name John Adams has a whole different meaning. Since 1973, John Adams, a dedicated Indians fan, has been attending practically every home Indians game. Not only does he attend every game, but he also brings along a bass drum and sits out in the bleachers playing it throughout the game. For first-time visitors to the stadium, it is always customary to point out Mr. Adams, right below the Roadrunner advertisement sign in the bleachers. Adams has now become a household name for Cleveland fans and has taken his drum to over 3,000 games. A staple of Tribe games, he was even honored with a bobblehead doll handed out at a game. Having a personal drummer is one of my favorite aspects of Progressive Field. All stadiums have some sort of quirky tradition. For instance, the Washington Nationals have a race of costumed characters meant to be US presidents and the Pittsburgh Pirates have a pierogi race. Progressive Field is home to the famous Sugardale Hot Dog Derby. At the end of the 5th inning, two doors in the outfield wall open and three hotdogs race around the field. The fans get involved cheering for either Ketchup, a prankster, Onion, a diva, or Mustard, an all-american boy. The race always gives the fan a nice chuckle and welcomed escape from the tension of the baseball game. I was born in 1994, the same year Jacob’s Field opened, replacing Cleveland Municipal Stadium. The new stadium breathed life into Cleveland and from June 12, 1995, through April 4, 2001, Jacob’s Field sold out 455 consecutive regular-season games. To remember the amazing sell-out streak, “455 The Fans” is printed in large red letters on a pillar behind the right field seats. This is just one of many rich historical stories of Progressive Field. While the name of the stadium has changed to Progressive Field, it is still remembered as the Jake by many Cleveland fans. 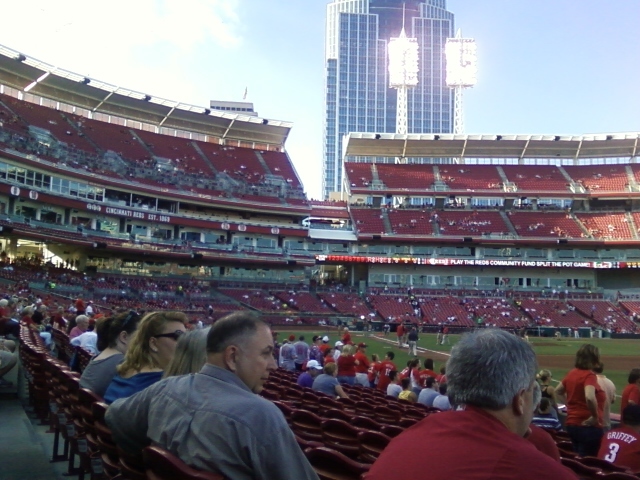 Putting the name aside, this ballpark will always be like a second home to me. There is just a comforting beauty about the field and the view of the Cleveland skyline. Whenever I spot the Bob Feller statue outside the stadium, or look up at the banners of different players, memories come rushing back. Memories of jubilation and also those of agonizing defeat. 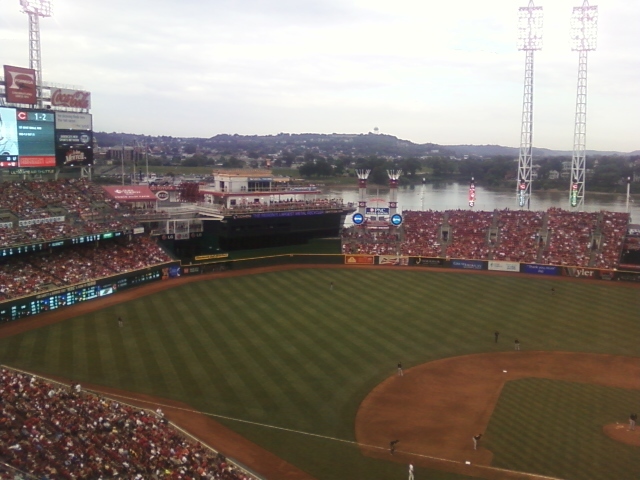 Blogging about baseball stadiums is an unexplored territory. Stadiums are timeless classics rich with history, not hot new trends people flock to. They become lost on the internet and seldom talked about. When searching for blogs on ballparks, I couldn’t find current ones that I liked. So instead of pointing out bad, discontinued baseball stadium blogs, I decided to focus on wonderful blogs dealing with the larger topic of sports in general. My favorite blog to look at is Waiting For Next Year. As the about section states, this blog serves as a wealth of knowledge on Cleveland sports. Being a Cleveland fan my whole life, I’m like a kid at Christmas when perusing the stories. One of the things I love the most about the blog is its name. I think Waiting For Next Year is the cleverest name a Cleveland sports blog could have. If you don’t get what I’m saying, just stop and think for a moment. When’s the last time a Cleveland sports team won a championship….oh right the Browns in 1964, it’s been 48 years!! The classic thing to say in Cleveland is “just wait ’til next year.” I know I have been waiting my whole lifetime. While hitting the witty jackpot on the name, Waiting For Next Year is also very user friendly and updated over a dozen times a day. It is easy to navigate and the stories are usually short and concise. I enjoy the fact that it has a podcast that you can listen to. If you want to know anything about the plight of Cleveland sports fans, waiting For Next Year should be your one stop destination. Another impressive blog to check out is Let’s Go Tribe. This blog covers all stories Cleveland Indians related. With opening day just a few weeks away, this blog is the place to go in preparation. The site has great usability with tabs clearly labeled anywhere from news stories to buying tickets. Let’s Go Tribe also has a page dedicated to other Cleveland Indian Blogs. This is a wonderful resource to use whether you are a diehard Tribe fan or just looking to check out the team’s composition for this season. Not a Cleveland fan, but still a sports fanatic? The last of my favorite blogs Bleacher Report is just for you. It has all the news you could imagine about sports. This blog makes it extremely easy to find the exact stories suited to your interests. Everything from NASCAR to UFC is included on the navigation bar. If you’re catching that baseball fever, just one click will get you to the page specifically for the MLB. I also, love how the website incorporates Twitter. Just below the navigation bar on the homepage are all the trending sports related topics. I bet all you Twitterers out there find that quite useful. Lastly, I think Bleacher Report has a strong identity. They know their niche and are able to thrive in that field. These blogs are all very similar, which I think is what makes them attractive to me. Definitely check them out. You will get more than your share of sports for the day.